Completed in late 2012, the Sherwood Middle School took center stage in a sprawling campus that features the former Sherwood Middle School and the refurbished Oak Middle School. Designed by the experienced architectural team of Lamoureux Pagano Associates Architects, Inc., the Sherwood Middle School project was constructed with the highest principles of sustainable design, on-site optimization and state-of-the-art engineering and technical systems. The architects placed equal focus on quality and value—the crux of Lamoureux Pagano’s building philosophy. 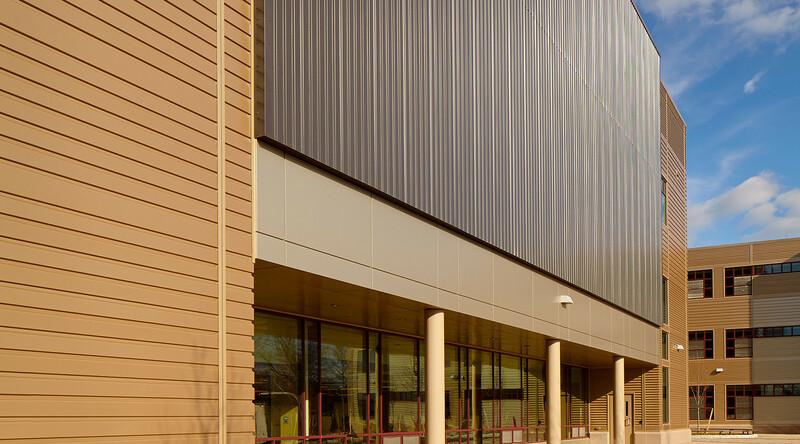 Beneath the attractive mixed-medium exterior of Sherwood Middle School is over 66,000 square feet of CENTRIA’s MetalWrap™ Series insulated composite backup panels, boosting the project’s thermal value and providing a second line of defense against the harsh weather conditions of America’s Northeast. While MetalWrap’s 3-inch panels boast a considerable R-value of 21, building designers were more impressed with the product’s unique, single-component construction, eliminating the need for separate batt or board insulation, exterior gypsum, air barriers, vapor retarders and building wraps. As Principal Architect and President of Lamoureux Pagano Associates Architects, Inc., Mike Pagano, AIA, knows firsthand the value that CENTRIA’s MetalWrap Series brings to a project. Pagano’s firm was one of the first in the nation to utilize this improved technology. Project Manager Don Chambers, Vice President of LYMO Construction, reported that MetalWrap’s quick installation time provides a major advantage to building owners, general contractors and installation teams. MetalWrap provides a weathertight building exterior in a fraction of the time required to install traditional multi-component assemblies. The weathertight construction also expedites interior trade installation, helping to keep the Sherwood Middle School project up and running through inclement weather. Utilizing CENTRIA’s patented Advanced Thermal and Moisture Protection (ATMP®) technology, MetalWrap’s composite construction allows installers to avoid a major pitfall of multi-component systems: air and moisture breaches. Gaps in the air and vapor barriers or insulation can lead to unwanted condensation, reduction in thermal performance and a compromised building envelope. MetalWrap’s insulating core does not experience any degradation of thermal value, as is common with batt insulation. The foam core is encapsulated by 29-gauge Galvalume skins, which serve as the primary air and weather barriers for the system. 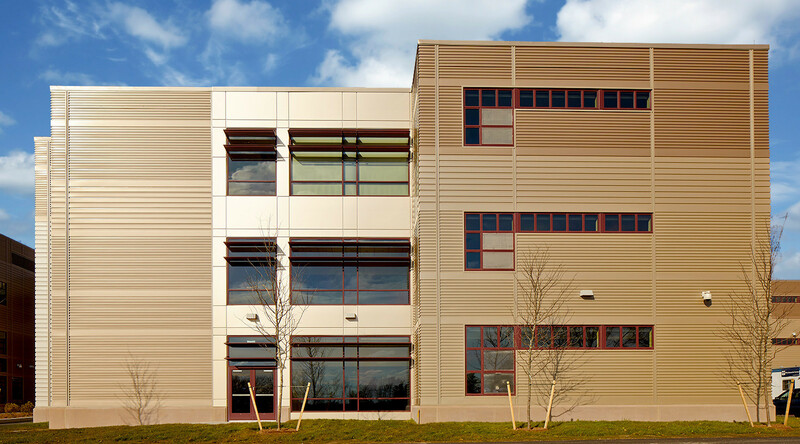 Sherwood Middle School takes advantage of a mixed-medium building envelope, incorporating metal cladding and masonry to achieve a unique blend of high-performance and modern architecture. The MetalWrap System is equipped for use with metal, brick and terra cotta exteriors, making use of a unique clip design and integral masonry anchors and supports. It ensures simple and quick installation under a wide-array of building exteriors. 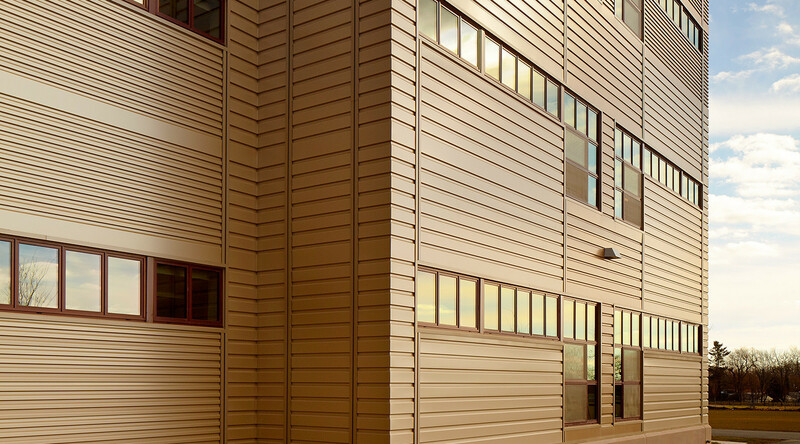 MetalWrap integrates seamlessly with the project’s masonry surfaces, as well as the exterior cladding, provided by CENTRIA’s Concept Series panels. All told, building designers implemented nearly 100,000 square feet of CENTRIA’s sustainable metal wall and backup panels, adding yet another level of value to the impressive project. 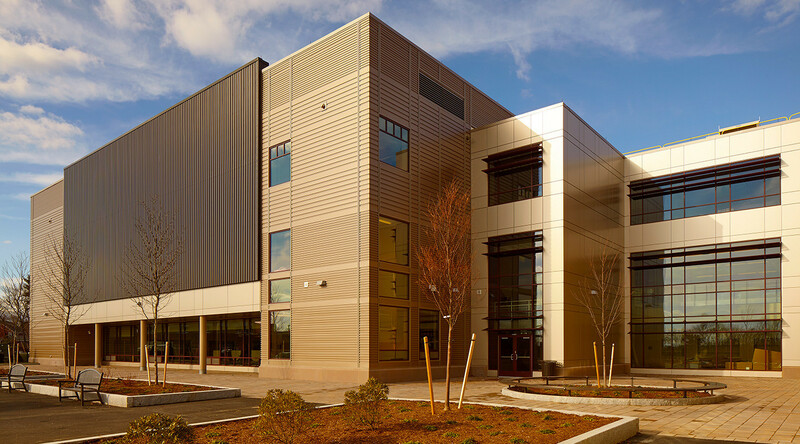 In addition to superior energy efficiency, CENTRIA metal wall systems like the Concept Series panels used on Sherwood Middle School are often fabricated to length in the factory, minimizing jobsite scrap. CENTRIA products also contain a high volume of recycled content and environmentally friendly materials. The MetalWrap Series offers more than reduced labor costs and installation time. According to Chambers, MetalWrap’s single-component design transcends the bottom line by presenting an eco-friendly construction alternative, benefiting building owners, architects, contractors, installation teams and, most important, the environment.